"Aquatica Plus UK ships Aqua Moda® Solar Fountain With Brushless Pump, Timer, Battery Back Up and LED Lighting from Amazon.co.uk. Amazon.co.uk has fast shipping in the UK and often free shipping on pond and aquarium supplies. Add to your basket now while supplies last to avoid delays." 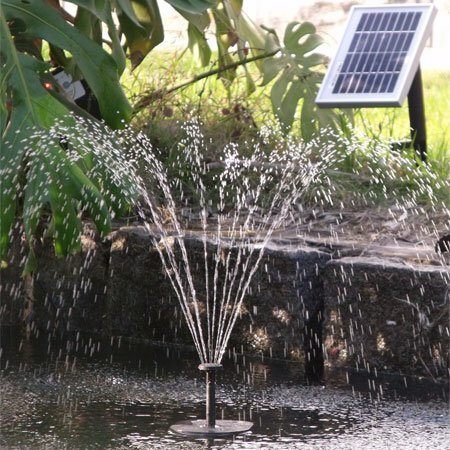 The solar powered fountain pump is a breakthrough in solar technology. This system utilises separate rechargeable battery-incorporated control housing, allowing the pump to function while not receiving direct sunlight (3 hour timer). The pump utilises a high capacity solar panel which supplies the control unit with energy. The solar panel comes with a stand and is manufactured from durable aluminium and polyvinyl butyral. Solar LED light for night time illumination. Key Features: Automatically recharging battery back-up - 180LPH max water flow rate - pond float included - LED light ring - 500mm max water lift height - Selection of three fountain heads. Specification: Cable Length: 5m - Rated voltage: 8V - Solar module: 1.3w - Amperage: 162MA - Water lift Max: 0.5m - Water flow max: 180LPH - Solar panel dimensions: 190mm (length) x 150mm (width) x18mm (height) Includes: DC Water Pump - 5 metres of cable - Solar panel with rechargeable NiMH battery pack - Spike - Nozzle adaptor (fitted to pump) - Extender x 4 - Fountain head universal base - Fountain head - Fountain head cover x 3 - LED light ring. What customers say about Aqua Moda® Solar Fountain With Brushless Pump, Timer, Battery Back Up and LED Lighting? Had this pump now for a couple of months and is a first class product,which i use in a half barrel water feature.Unlike other solar power pumps that i have had , this has a battery back up which means will work on cloudy days and in evening.It works on a timer basis for 3 hours then switches itself off -if you want to have it on longer then just press the on switch and will work for another 3 hours,bearing in mind this is solar powered this is an excellant idea,as battery back up will always be charged and you know the fountain will actually work when you want it to.Particularly like the differant fountain head adapters to vary the spray also. It’s wonderful to have lights that function under water. It’s an option – you can place them lower on the fountain neck. Good long cables allow choice of locations for solar panel. My panel is on an old broom handle I’ve driven into the ground. Sounds crude but works well.